Home is where the heart is this Christmas when you order this Personalizable Handmade Gingerbread House. No Christmas is complete without traditional Christmas goodies like this handmade gingerbread house that is completely customizable. Created from spicy gingerbread and an assortment of delightful holiday candies, this edible creation is hand decorated and can even be personalized especially for your family members, friends or coworkers this holiday season. 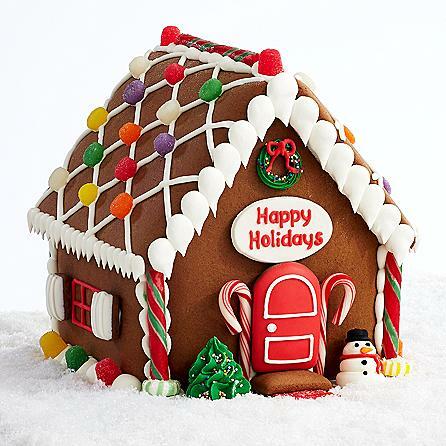 Gingerbread houses make excellent Christmas gifts for kids of all ages, and this handmade creation is sure to be a hit. Personalize with up to two lines containing up to 9 characters each, and create unique Christmas gifts for everyone on your list! A wonderful addition to your loved ones’ holiday décor, this Personalizable Handmade Gingerbread House looks almost too good to eat!